There are times that I wish I owned a teleporter. Actually, pretty much every day I wish I had a teleporter. It would make things a bit easier, especially when it comes to being part of family events. When I moved here, I knew I would be giving up the ability to see my family every day. I mean, I kinda had to, right? The good thing is that my family is really good about keeping me updated on events and life in general back home. Today, I even got to talk my 2 year old niece, Anabelle, on the phone and for the first time, she was able to clearly say, “I love you, Manda.” It was quite possibly one of the most heartwarming moments of my life! I am looking forward to my trip home this summer so that I can hug and squeeze that little sweetie pie! And because of her incredible love for reading, she got a special award for it! Her teacher announced that she is the only one in the class who has overachieved her reading skills. To pass the 1st grade, you need to read at Level 3. Vanessa reads at Level 10! Wow! Thank you for encouraging her to read and for buying her all those books! 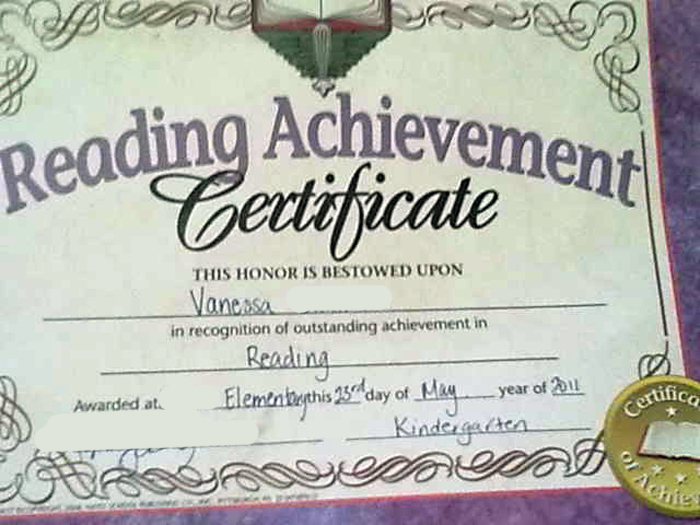 I know it seems silly that I would get so excited for a Kindergarten award, but I am! I know that this is just one step closer to her having a quality educational experience! I don’t know what she will grow up to become. The way she imitates people and tells stories, she might be an actress. The way she reads and soaks up information, she might be a researcher. She may be a dancer, a cheerleader, a world-traveler, a rock star, a mother, a nurse, or even a political official. Whatever she chooses to be, I feel confident that she’ll succeed, knowing that she is rising to new challenges and learning so much by her own volition at such a young age. 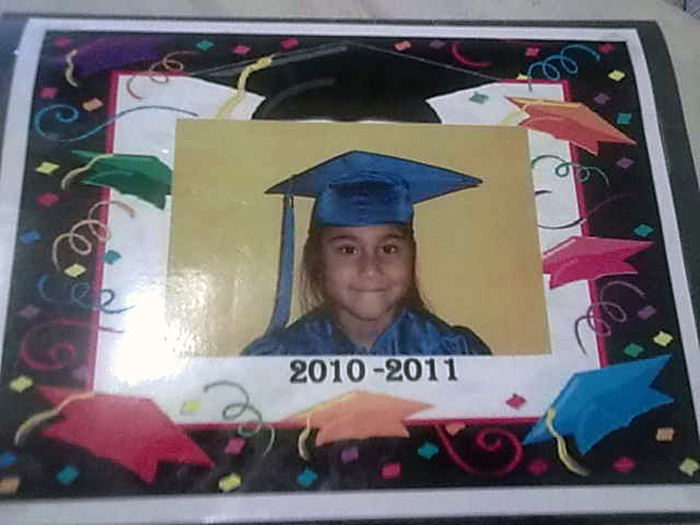 Seeing her grow like that just makes me a super proud Aunt! Categories: That's Right, I Said It | Tags: Anabelle, Education, family, I love my family, Kindergarten, Proud moments, vanessa | Permalink. In one of the more coincidental moments in my life, I walked into The Jewel Box Cafe last night, and as I was ordering my coffee and grabbing a seat in a nearby booth, John Mayer’s song, SAY, was playing in the speakers of the cafe. Recalling the lyrics as the song played, I rolled my eyes and sighed as I realized it was representative of what I knew needed to happen that night. Let’s rewind, shall we? About 3 months ago, a series of events happened and I started to notice that a friendship that I held dear was beginning to dissolve—not because of things that had been said, but by a lack of things that needed to be said—issues that needed to be confronted. In what seemed like record timing, I had been hurt, manipulated, pushed away, and seemed to have disappeared from a friendship and a project that I held dear to my heart. I felt like an outcast, a weakling, not worthwhile. During those past months I tried to bring things up in conversation with them to confront and fix it but they kept avoiding it. I wanted to know how to fix things, to be back on a level of open and honest communication—I needed closure and I wasn’t getting it. That only frustrated me more and I began to feel like I had lost a great friend. And more than just feeling shut out of a project, I felt shut out of a friendship. One thing I’ve always held onto, and that I’ve always taught to kids I would babysit or people I would mentor, is that no matter what you’re arguing about, the friendship is more important and you should fight to make that a priority. Relationships matter more than anything. For about the first month or so I spent day in and day out internalizing the hurt and trying to fix myself. I tried to figure out what I did, what I said, what I might have not noticed, and I felt like a giant failure. The shoulda’, woulda’, coulda’s, were overwhelming my thoughts and my attitude. The more I internalized it, the uglier I became inside. I held onto negativity, anger, and low-self esteem like they were my pets—and in those days, they were. My trust, my heart, and my spirit had been broken and there was nothing but hopelessness inside me as I would read passive-aggressive things the person would say online and as they began to ignore me day after day. The hurt and loneliness grew stronger and over time, I began to lose sight of who I was and forgot what was important—I wasn’t allowing my faith in God and my identity in Him to be the focal point of the situation. I was trusting myself to fix something. All of my life I’ve been a fixer. I’ve fixed relationship issues that friends had with others, relationships in my own family, and problems that I had faced in my own life. Facing a problem and solving it has always been a driving point in my life. But in that situation, nothing I was doing was working. I couldn’t fix it. And that made me feel weaker than anything. And it wasn’t until last night, in the cafe with Alisa that I realized that I needed to feel weak. I needed to remember that I can’t fix everything. I can’t solve every problem in the world, and I can’t let the things I’m unable to fix define me as unworthy. And over the course of the few months, I had to come face to face with the fact that sometimes life throws a punch your way and you have to just learn to roll with it and keep moving forward, and that when the punch comes, you don’t have to deal with the pain alone. Having reached the lowest point of that particular valley, I finally remembered that I needed to surround myself with people who cared deeply for me. I needed the ones I knew I could trust, the ones I knew held my heart in high regards, who were willing to walk through the season with me. I confided in 3 of my friends the things I was wrestling with in my mind—fear, pain, loneliness, anxiety, shame. And they showed up and offered hugs, kleenex, prayers, a listening ear, a fresh perspective, and wisdom that I hadn’t considered. As a result, I spent an entire day composing an e-mail to that friend. It took a day because I kept wanting to delete it, not ready to admit to them that they had hurt me. I wasn’t ready to admit defeat, but I did. And after it was all said and done, and they apologized and we cleared up a few things, I felt a little better. The road back from ugliness and petty slight has been a rough one, but I’m healing quite nicely. Now let’s fast forward. Last Sunday, Alisa asked me, “How are you doing?” and not wanting to lie or give a token answer, I said, “A lot better. I’m doing pretty good, I guess.” We hadn’t had the chance to hang out one-on-one in a while, and I hadn’t mentioned anything to her about what had been going on. So she said, “Let’s get together and talk about it.” I really missed spending time and talking with her, so I agreed. Then I thought, “Wait. What did I just agree to? I don’t know if I can handle talking about it again. I’m still trying to bounce back from it all and I’m not sure I can do this.” We decided to go out on a late night coffee date last night, and what happened in my heart in that cafe last night was nothing short of wonderful. As I recounted everything, focusing on the things that God had shown me about myself and about what was important in life, how worthwhile I am as a person, and ultimately what my purpose in life is, I was able to walk out of that cafe feeling less weighted down and like I had taken another step forward. Alisa shared with me similar situations she had faced and the great things that had come from those repaired friendships and my hope was restored. Alisa and I share similar back stories and life experiences. She has always been so real, open, and honest with me in our talks together. I never have to wonder if she’s ‘just saying’ something to make me feel better. She challenges me (as do my other close friends) to come out of hiding, face the stuff that comes up in my life, and move forward. As we talked last night, she didn’t judge me or deny the validity of what I was feeling. She listened, and shared wisdom, and helped me put a game plan in place to help me put into practice the things I had learned along the way. Through our conversation, I was able to not only be honest with her, but to be honest with myself and realize some things that I hadn’t dealt with in my own heart. One of the things she brought up in the conversation was something she’d heard from another mutual friend of ours: “Sometimes we need to be shattered so that God can put us back together and make us whole again.” That was exactly what I needed to hear in that moment. It’s amazing to think of all the people I took for granted and the moments I passed up because I spent so much time focusing on trying to fix something that I was never meant to fix. Over this whole messy and silly ordeal, I’ve come to realize how blessed I am to have such a strong support system here in Seattle. I mean, I have a great one back home too, but it’s nice to know that I have the same thing here, ready for me when I need it. It feels great to get back to what is really important and to be able to look ahead with hope and purpose—to be able to say to myself and others what needed to be said. Categories: FORWARD, That's Right, I Said It | Tags: faith, Friendship, Healing, Honesty, life lessons, My friends are awesome, relationships, Things that are messy, Things worth fighting for | Permalink. and I thought I’d share about it here! After high school, I enrolled in a program called Master’s Commission of Austin. I learned a LOT while I was there about the person I was, the person I wanted to be, and the person I was becoming. It was an environment that helped me fuse my faith and life in a way that I had never experienced before. About midway through my 2nd year at MCA, our Director met with me and said he and the staff had been impressed with my work and asked if I would like to take over their publications and work in their Media Department. I would intern on the media team, and still be responsible for maintaining my academics and other graduation requirements. Because this offer was out of the ordinary (2nd year students didn’t start internships unless they came back for the 3rd year of the program), he told me it would require a lot of responsibility and sacrifice, and said that he didn’t need an answer right away, that I could take time to think it through. But I knew deep down that graphic design, publications, photography, and the creative arts in general, were part of my heartbeat and I HAD to do it—it was what made me tick! So I agreed to it then and there and went straight into training to work on newsletter that they were going to be sending out. I spent 2 years as an intern under the amazing Brian Brooks and learned how to really hone the craft of design and teach it to others in an effective way. After 3 years in MCA, the Director decided to move to Louisiana and we were told a new Director was coming in. Instead of joining some of my classmates in the other MC program in Louisiana, I decided to stay behind and serve on support staff for our new director, Dan, as Media Director. My time in MCA as the Media Director was bar none one of the greatest experiences of my life! I had students joining my team who had never worked with graphic design before in their life, but they wanted to learn it so bad and I wanted to teach it so bad! Some knew a little bit of the basics of photography and design, but the majority did not. I spent those next 5 years living on cloud 9 as I spent day in and day out teaching students the many things involved in print/web/film design: how to become more aware of the practical design elements in their daily surroundings, how to research colors and marketing tactics used in design, how to work in Photoshop, Illustrator, Streamline, PageMaker, QuarkXPress, Dreamwever, Flash, and Final Cut Pro. I loved seeing them take this technical art and make it into something worthwhile! It made my heart so happy to be able to provide an opportunity for them to see just how much they WERE able to do in design work, when they themselves and others around them said they could never do it. We learned to work as a team and shared the rewards and sacrifices together. It still amazes me to see the work that they have produced even years later, and to see them using the skills they learned, to make money and ‘put food on the table’ all while still being completely in love with the art of design! On staff, I was also responsible each year for teaching book studies, leading a missions trip, providing accountability/counseling for students, and investing in the lives of a particular class of students. As you can imagine, there are a bazillion memories that I made there that I hold dear. Today, a large group of them are all gathering back in my hometown in Austin, TX for an MCA Reunion. I am upset that I couldn’t make it down to be with them and give them all hugs, so I decided to make a video for them instead so that I could be there “in spirit.” Technology being as amazing as it is, I also decided it would be worthwhile to share it here! Cue the Indian: One of our students, Jonathan Ostrander (Jono) was joking one day about how the intro to Enya’s Return to Innocence sounded like it was an Indian chant. So a few weeks later, I was being goofy and decided to put on a rainbow clown wig we had in the prop room and record myself on my laptop doing an American Idol audition. After I was done explaining to the judges that I would be the next American Idol, I introduced the audition by saying, “And without further adieu, cue the Indian.” And lip synced Enya’s Return To Innocence into a pen, wearing a clown wig. It was ridiculous. For those wondering, that video was lost in a hard drive crash and won’t be seeing the light of day (Prayse da Lort). Green/Brown/White office: Every time I brought in my redecorate/painting design plans for the media office to Dan, he’d always say, “Are you sure that’s going to look good?” and he would doubt my color choices & designs on paper. But when the office was all painted and put together, he agreed that it was perfect and looked great . . . and everyone would come hang out in the “cool office!” So I put that in there just as a joke. Categories: FORWARD, That's Right, I Said It | Tags: about me, family, friends, i just love them, mca, video blog | Permalink. I go through seasons where I just want to make changes to my living space and spruce things up. I’ll rearrange furniture, add wall art, last winter I added twinkle lights to the top part of my walls to give a more dreamy feel. As I was laying in bed last night, I thought it was a great time to change things up. I really don’t know why, but every time I’ve decided to change things, it’s been late at night! So this morning I spent time working through color schemes and drawing out the floor plan of my room as it is so that I can think through moving around furniture, fixtures, etc. I don’t have a huge living space, so it’s important to utilize as much as I can with shelves and under-the-bed storage. I’ve had the same color scheme (lime & black) since I first moved here and I think it’s time to update that look. 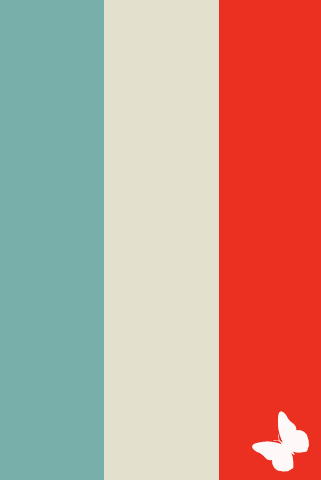 Lately, I’ve really been in love with this color combo, so I’m hoping to find a complimentary bedspread to go with it. I’ll be hitting up Urban Outfitters, Target, and Ikea soon to look for options, which will ultimately finalize my design scheme. I’m also going to be printing up some new wall art and rethinking storage solutions—and all of that makes me SUPER excited! On the topic of interior design, I think now would be a good time to share a couple of photos from one of the most creative bathrooms I’ve ever been in. And yes, you can totally judge me for taking pics inside a bathroom! It was just too cool to pass up! 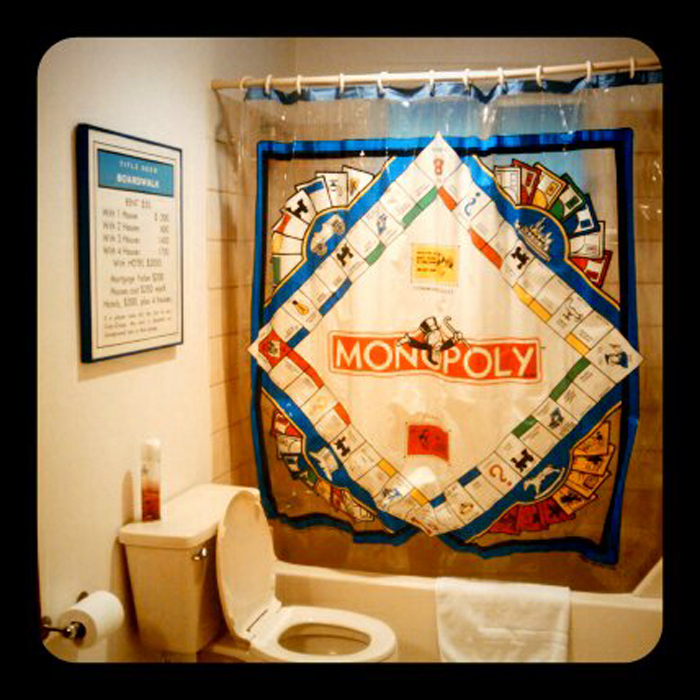 I spent Easter with my friend Heather’s family and this was her old bathroom and it’s Monopoly themed! Granted I won’t be decorating my room like this, but I definitely think it’s one of the neatest ideas. 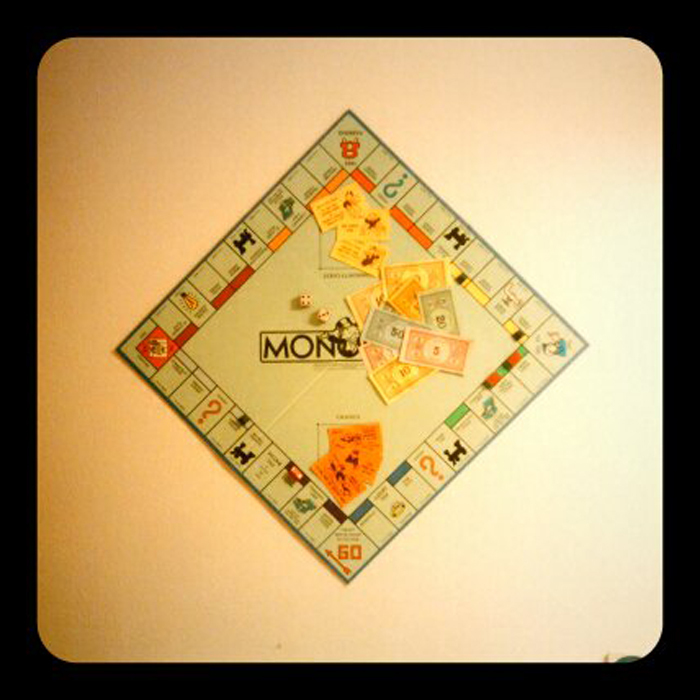 The tissue box holder was even decopauged with Monopoly money and the wall art is Monopoly game cards. I love when theme rooms are done right! Categories: Design Life, That's Right, I Said It | Tags: Bathroom, creative, Interior Design, Monopoly | Permalink. What are some others you might recommend? And what are some songs from your favorites that you think I should check out? 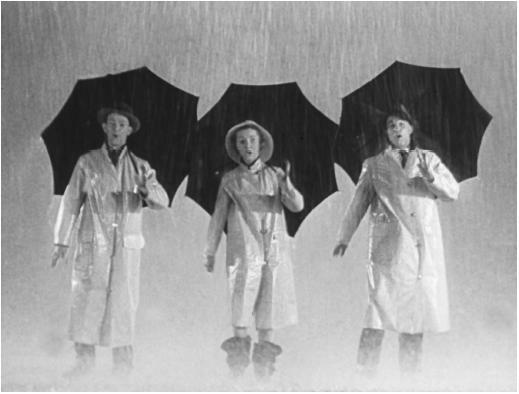 Categories: Music Discovery 101, That's Right, I Said It | Tags: musicals, my co-workers are AWESOME, Singing' In The Rain | Permalink.